Click The County for the District's Web Page. 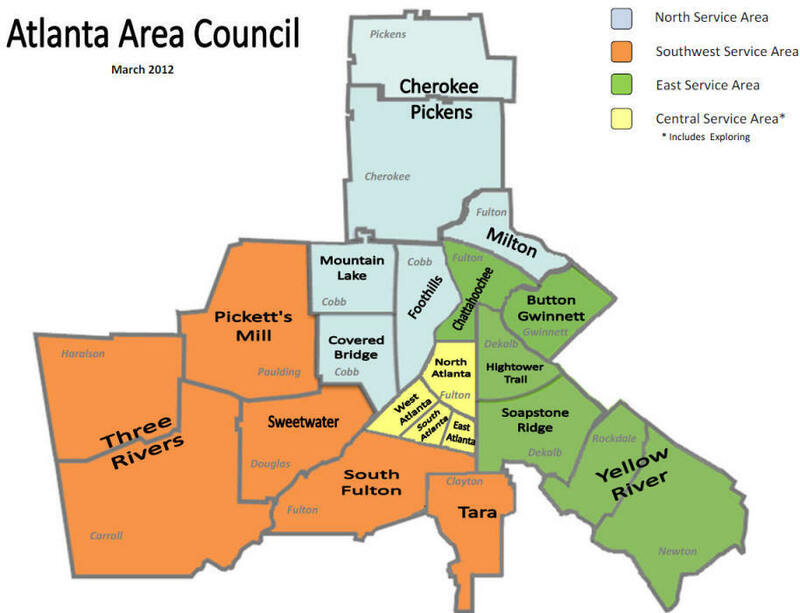 The Atlanta Area Council is complicated. Because of the populations of DeKalb, Cobb, and Fulton, they are subdivided into several districts. District are further grouped into a Service Areas. Northwest portion only: The rest of Gwinnett County is in the Northeast Georgia Council. Cherokee Pickens District changes their name to the Appalachian Trail District. Council merges the Mountain Lake District (NW Cobb County) and Covered Bridge (SW Cobb County). The District votes on the new name, Silver Comet, for the Silver Comet trail whose eastern terminus is, at the time, in Smyrna, GA. The trail's namesake comes from the Silver Comet passenger train that traveled that path from 1947 - 1969. 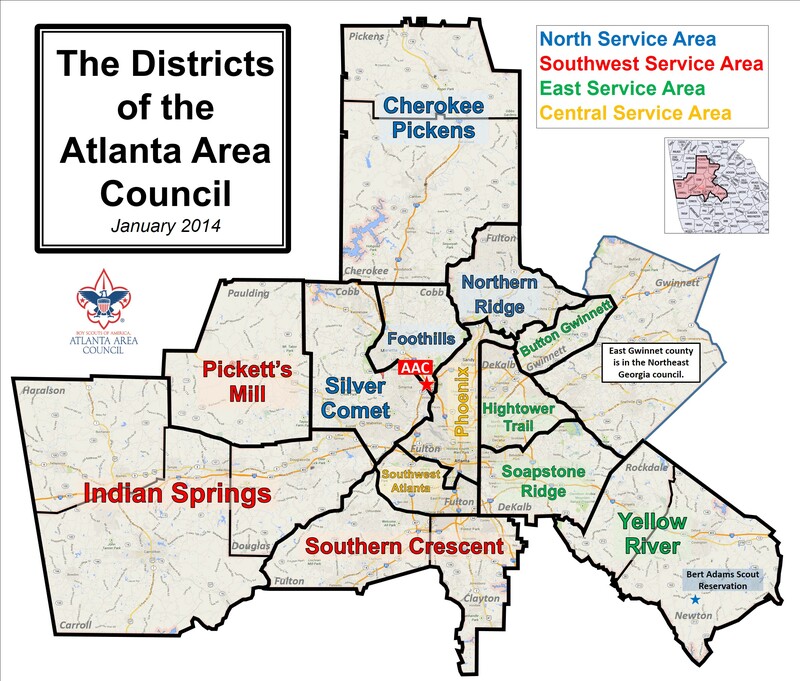 Council merges South Fulton and Tara districts into the Southern Crescent district. Sweetwater and Three River districts merge on December 5 to become the Indian Springs District. Chattahoochee District is divided into north of the Chattahoochee river and south. The northern part merges with Milton District and forms the Northern Ridge District. The southern portion merges with the existing Phoenix district. 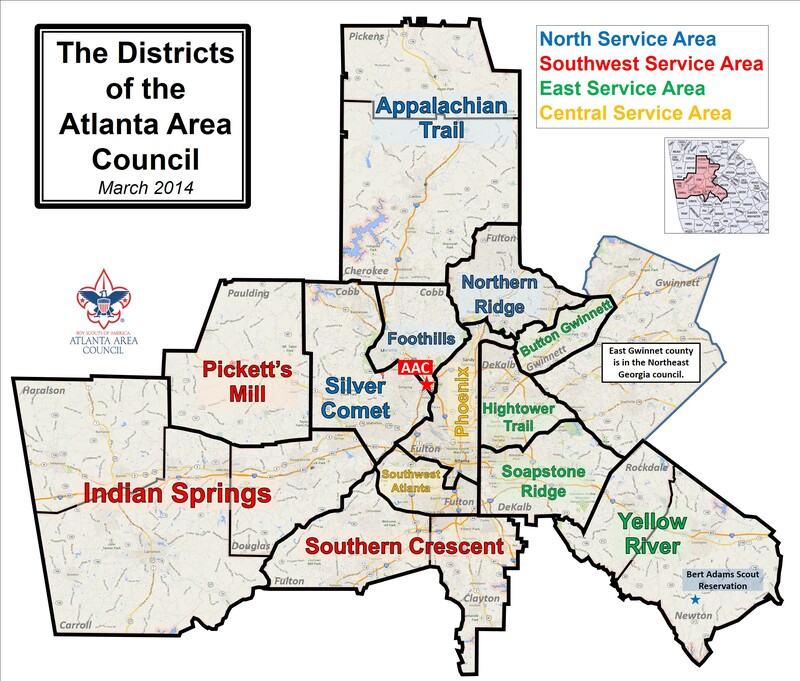 Council merges the North Atlanta and East Atlanta districts into the Phoenix District. the 2nd signer of the Declaration of Independence and an early governor of Georgia. Yellow River District: Named for the Yellow River which passes through both counties.